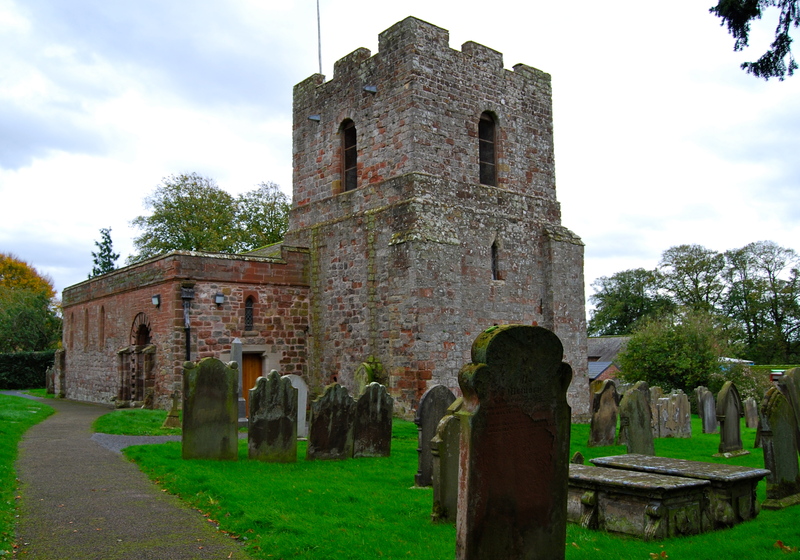 There are officially three fortified churches in Cumbria. Two of them lie on the Solway Firth and the third, the first picture in this post, lies in the Eden Valley at Great Salkeld a few miles north of Penrith. St Cuthbert’s Church in Great Salkeld was a brief resting place for the body of St Cuthbert when the monks spent seven years wandering through the north in fear of the Danes. These days it is more noticeable for its tower. The thick walls, narrow doorway and staircase as well as the ironbound door indicate that it was a place of safe haven from marauding Scots. At Newton Arlosh they say that the door is so narrow that the bride and groom have to decide who is leaving the church first. The spouse who sees daylight first will be the one in charge of the partnership so the locals say…I couldn’t possibly comment. The third church is at Burgh-By-Sands and it is probably the oldest of the fortified towers which is not surprising given that it lays so very close to Scotland. Its stones once formed part of the Roman fort of Aballava; a Celtic carved head reminds visitors that people have lived here for thousands of years. The church lay in the domain of one of the knights who killed Thomas Becket and in 1307 Edward I was laid here in state after dying on his way to war with the Scots. 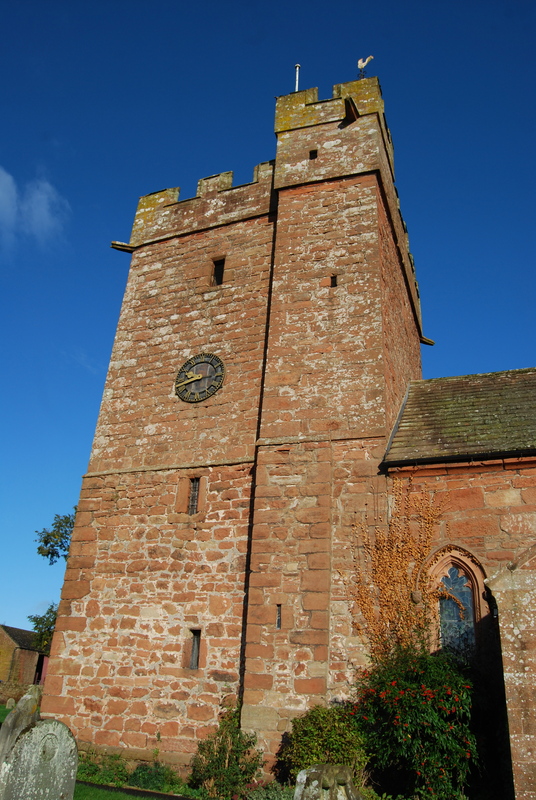 The tower caused the Bishop of Carlisle some distress because when the villagers built it they managed to undermine the foundations of the church. One thing is for sure the builders meant business. The tower is heavily buttressed and several feet thick as well as the narrow entrance, the iron yet is still in place with its three great bolts and there is a huge slot in the masonry for a bar to be slid into place. There are narrow windows through which arrows could be fired and there is evidence of archers having sharpened the tips of the arrows on the walls of the tower. When gunpowder became more readily available someone cut a gun loop in the lower room and a height that would leave attackers facing kneecapping at best. The tower is vaulted and there is a narrow spiral staircase just the same as in Great Salkeld. Of course there are a number of other churches in the area where villages- and certainly the priest- sought sanctuary in time of trouble. The tower on the church at Edenhall (another St Cuthbert’s and another resting location for the saint’s mortal remains) has a funny little tower that includes a ‘mini’ steeple. It was built in the fourteenth century and was probably used in much the same way as the three fortified churches already described but unlike the towers at Newton Arlosh, Burgh by Sands and Great Salkeld the tower in Edenhall lacks the narrow doorway and the iron bound door. Other strategies were devised elsewhere. In Corbridge the vicar came up with an alternative means of self-preservation. There is a peel tower in the churchyard where the vicar could flee in the event of trouble and the wall around the churchyard is fairly stout too. At Kirkby Stephen the church tower is a handy vantage point that enabled two Westmorland’s Pilgrimage of Grace ringleaders to evade capture by Henry VIII’s men and is also part of a more general defense strategy whereby the streets narrow so that the townsfolk could defend their property more easily against border reivers. This entry was posted in Anglo-Scottish history, Fourteenth Century, Kings of England and tagged Burgh-By-Sands, fortified churches, Great Salkeld, loop hole, Newton Arlosh, Reivers, Solway Firth, St Cuthbert, tower defenses, yett by JuliaH. Bookmark the permalink.